The goal of the homework assignment was to design a system that would create a behavior change in a group of test subjects. The behavior change that I picked was getting people to follow me on Twitter. I guessed that if I programatically favorited people’s tweets, they would get a notification about it, and might decide to follow me. It worked, and it worked well. Myles Recny is pretty impressive. Favorites are fare game if you ask me (read the comments if you want an insider look on Hacker News’ vitriol and anger on spam favorites, which literally makes no sense). If I had this as an assignment, I would be pretty lost. 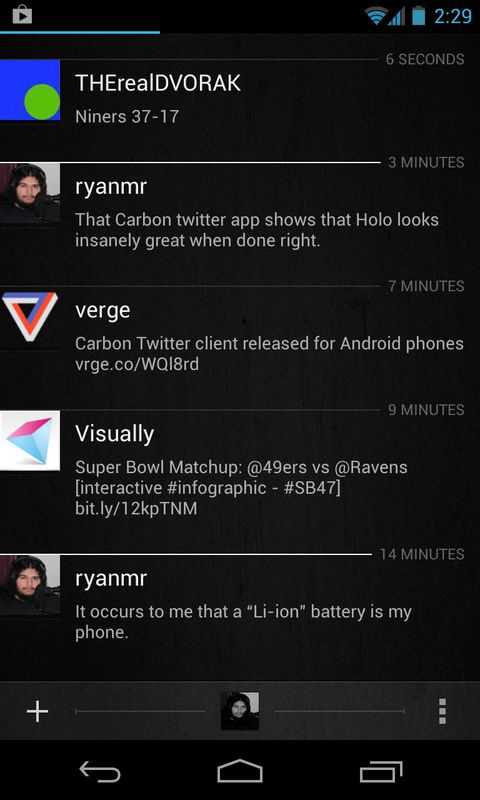 Carbon is a modern Android Twitter client. It looks great. I set my Carbon to use three panes, one for the regular Twitter timeline, one for mentions and the last for direct messages (all four I get per year). The app is consistently dark, which is great on a phone with a black bezel and for those indoors all day. Tapping on a tweet brings up a side-pane that tells you information like client sent from, time, and gives access to in-tweet links, replies, reweeting, favoriting and so on. Of course, as standard these days, it has a conversation view which has a novel design effect when used. Long pressing on a tweet in the timeline will open a smaller in-line interaction bar for tweeting and replying too. There’s a great favorites tab too, which is handy for reviewing the news you’ve saved through the day. Pulling to refresh makes the entire timeline slide back away from the top of the screen which looks stunning visually. I have extensive screenshots detailing Carbon. Seriously, look at them. While all of this is great, there are two sad aspects. The first is that I cannot simply share a tweet by long pressing into the in-line interaction bar — there’s no sharing action there. I have to tap into the tweet pane and then share that’s also hidden in the menu button. I frequently share to Evernote and Pocket. The second is that this application is free. I would pay for something this great — maybe $2 or $3. The genesis of Twitter applications that I have used is long and difficult. I started, as did everyone, with the native Android app, then I moved to Tweet Lanes in Spring last year. That fell away when the developer, at the hands of Twitter, saw no market. I migrated to Tweetings by Thanksgiving last year. Tweeter is a great medium, but the app is what makes the messages in the medium possible. No client is the end all, be all, so this isn’t the last, but it may just become the current. Facebook went through this transition a few years ago with its users without a single person in the real world noticing. Developers nailed it. This isn’t rocket surgery. They’ll nail it here too. It’s sad that TweetLanes, a great Twitter app for Android, will basically end active development. Twitter’s decision essentially forces me to do one of two things: begin using their pretty horrible app on Android or alternatively, stop using Twitter. So the choices we make matter here. The release of the astoundingly great Tweetbot for Mac came out yesterday. But along with it, the $20 price tag caused horrendous outrage. Here are my thoughts. I have seen people compare Tweetbot’s price to the update between 10.7 and 10.8 — let’s get this straight; that upgrade was for the price of the new features. Your Mac already had a completely stable and usable OS; 10.8 just added features and minor refinements. Tweetbot’s price covers a complete feature that was not present previously nor subsided by relatively high hardware prices. Angry Birds is priced in tiers, cheap on iPhone, mid-range on iPad and the most expensive on OSX. As far as one can tell, the price is related to the screen size, which is fair, because each gets progressively more expensive. Tweetbot, though, is the same price on both its iOS versions for iPhone and iPad: $2.99. The Mac version costs $20. That’s a huge difference. The stated reason, I guess, is that Twitter messed everything up for Tweetbot when tokens for users became limited. Limiting tokens put a hardcap on the number of users an app could have, which means a hardcap on the earnings from the app. To make up for the smaller set of tokens for Tweetbot, they decided to have a high price for the app. I wonder about this though: with the price so high, what will happen when the beta testers (while the app was free) don’t actually go out and buy the app, but leave their Tweetbot token to languish? Or does the released version use a different token? Neal Young sent me a link to clarify about the token situation. If you’ve used the Alphas/Betas and have decided not to purchase, please do us a huge favor and Revoke access; that frees up extra tokens for potential customers (the betas will expire anyways). $20 for a Twitter seems high, but I wouldn’t mind an alternative. Paying the developers $10 for a great looking and well working app seems fine for correspondingly priced apps on iOS, and paying $10 to Twitter for less ads, more tokens and maybe more friendliness. Just so you know: I bought Tweetbot. If Twitter kills IFTTT then you can not only say goodbye to my blog’s twitter and The Nexus’ twitter, but potentially thousands of other automated accounts. Sure, we’re not there yet, but seriously, a few pixels of space for another company or service wouldn’t hurt Twitter at all – but this is just more bad press, which definitely does. Tweetbot intends to make money from their software, and their software only works when they have enough user tokens to distribute. This Twitter situation is getting utterly ridiculous. Tweetbot for Mac is coming out soon, Tweetbot for iOS isn’t going anywhere. So sit down, grab a towel and let’s go over some of these API changes. As long as Tapbots’ okay with it, I am too. The real question, of course, is whether enough people will use the new service to make it fun and interesting. Social networks become exponentially more useful and valuable as more people join. And I don’t think most of the people I follow on Twitter give a damn about switching to a new Twitter — especially one they have to pay for. That is what everyone thought when Facebook emerged and the critical mass was on MySpace. Twitter has not had a competitor steal away its mass yet.